Ireland put their previous disappointments behind them to become the only team in the top 10 at the World Amateur Team Championships to card a combined round under par in round three on Friday. The result leaves Ireland in fourth position with the final round to be played over the O’Meara course on Saturday. The Irish trio were back on the Montgomerie course where it was a bright start for them earlier in the week and it was again Olivia Mehaffey who led the charge on “moving day”. The 20-year-old from Banbridge birdied three of her last four holes for a two under par 70, displaying an air of calmness in holing some testing putts on the sloping Montgomerie greens. “I was really disappointed with yesterday, I think even this morning I wasn’t over it,” she said. “I had to go to the gym and get a wee bit of frustration out. Her score was the best of the day on the Montgomerie course where the wind played havoc for the international visitors. Annabel Wilson’s level par 70, which began with nine straight pars, was the second counting score of the day for the Ireland team. Birdies on the 11th and 14th were counteracted by bogeys at the 10th and 12th for the Lurgan teenager, who closed her round with a superb up and down from behind the 17th green to save par – a save which could prove crucial at the end of play today. Paula Grant, who, in spite of not firing on all cylinders, has kept spirits high amongst the team and all week has oozed positivity on and off the course. Showing considerable determination after an unfavourable start, Grant carded four birdies in her closing 13 holes, including both the 17th and 18th to give her a boost of confidence heading to tomorrow’s final round. 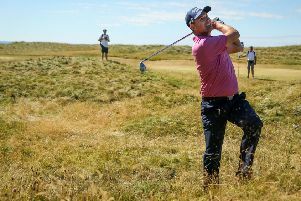 Irish hopes of a medal place is within the realms of possibility as the USA, Korean and Japanese teams made little headway in yesterday’s breezy conditions. While the gap to a Bronze medal finish is still nine shots away, Mehaffey is looking forward to what the final round might bring. “We play good when we’re being aggressive and you can do that on O’Meara.,” added Mehaffey. At four-under par, Mehaffey is tied fifth place individually, 10 shots behind leader Ayen Cho from the Republic of Korea but it is the team competition that Ireland have in their sights which is certainly not over yet.